Italia, Sicilia, Catania, 95126, Via Paolo Gaifami, 18. Dr. Flaviana Di Lorenzo, Dr. Angelo Palmigiano, Dr. Sami Al Bitar-Nehme, Dr. Luisa Sturiale, Dr. Katarzyna A. Duda, Dr. Djamel Gully, Prof. Rosa Lanzetta, Dr. Eric Giraud, Dr. Domenico Garozzo, Prof. Maria Lina Bernardini, Prof. Antonio Molinaro, Prof. Alba Silipo. Chemistry-A European Journal, December 2016. The search for novel lipid A analogues from any biological source that can act as antagonists, displaying inhibitory activity towards the production of pro-inflammatory cytokines, or as immunomodulators in mammals, is a very topical issue. To this aim, the structure and immunological properties of the lipopolysaccharide lipid A from the purple nonsulfur bacterium Rhodopseudomonas palustris strain BisA53 have been determined. 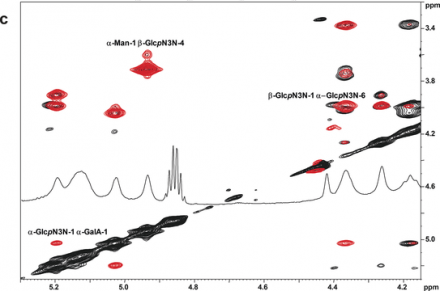 This lipid A displays a unique structural feature, with a non-phosphorylated skeleton made up of the tetrasaccharide Manp-α-(1→4)-GlcpN3N-β-1→6-GlcpN3N-α-(1→1)-α-GalpA, and four primary amide-linked 14:0(3-OH) and, as secondary O-acyl substituents, a 16:0 and the very long-chain fatty acid 26:0(25-OAc), appended on the GlcpN3N units. This lipid A architecture is definitely rare, so far identified only in the genus Bradyrhizobium. Immunological tests on both murine bone-marrow-derived and human monocyte-derived macrophages revealed an extremely low immunostimulant capability of this LPS lipid A.